This is a very simple metric, often called the “burn-up” chart. Real live features, done, tested, delivered consistently from the very beginning of the project to the very end. 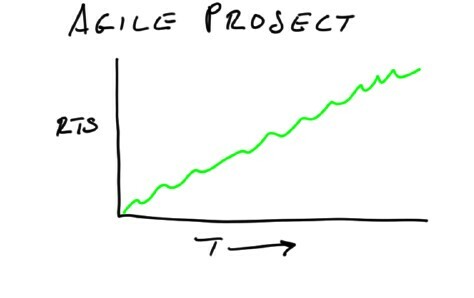 Demand this from any project, and they must become agile in response to the demand. Look at all the fuzzy stuff on this picture. There’s blue fuzzy unpredictable overhead in requirements and design and testing. We can time-box these, and often do, but we don’t know how much work is really done, or how good it is. And the apparent feature progress itself may also be fuzzy, if the project is planning to do post-hoc testing. We think that we have features done, but there is some fuzzy amount of defect generation going on. After a bout of testing — itself vaguely defined — we get a solid defect list, and do some rework. 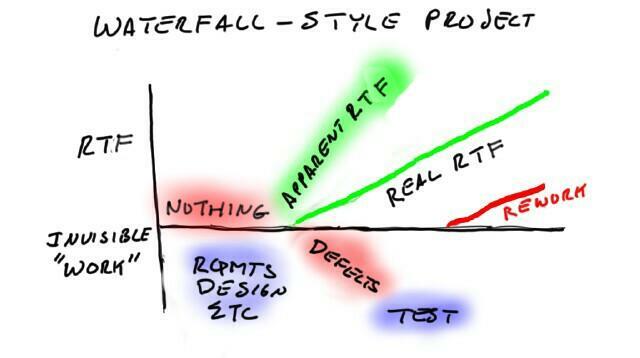 Only then do we really know what the RTF curve looked like. The bottom line is that a non-agile project simply cannot produce meaningful, consistent RTF metrics from day one until the end. The result, if we demand them, is that a non-agile project will look bad. Everyone will know it, and will push back against the metric. If we hold firm, they’ll have no choice but to become more agile, so as to produce decent RTF.